Deliciously simple appetizer (who am I kidding…I eat this as a meal! ), pakoras are quick and easy to throw together with simple ingredients and minimal work, particularly if you use a food processor. It’s a very forgiving recipe, thankfully! Feel free to experiment with spices…I used ones had around but the traditional carom seeds would be a welcome addition, but something I don’t routinely have on hand. 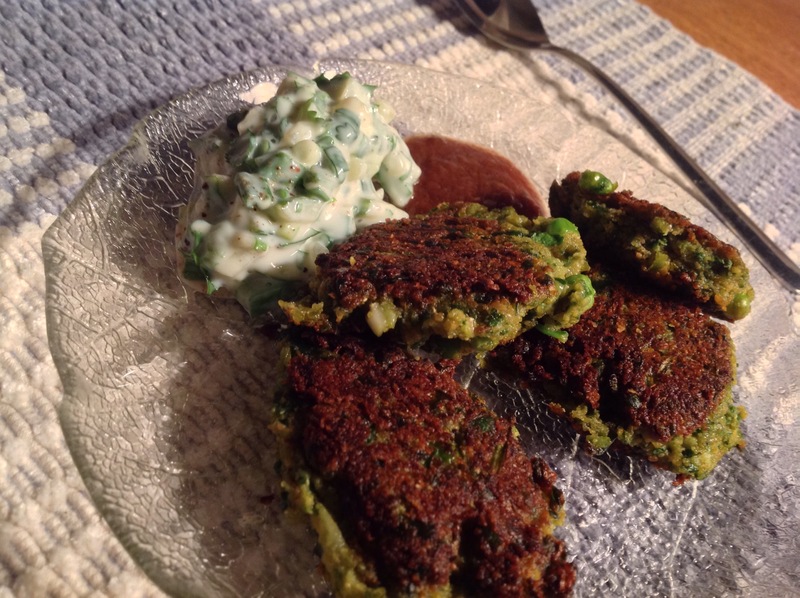 You won’t believe that this recipe is entirely free of animal products, and gluten! 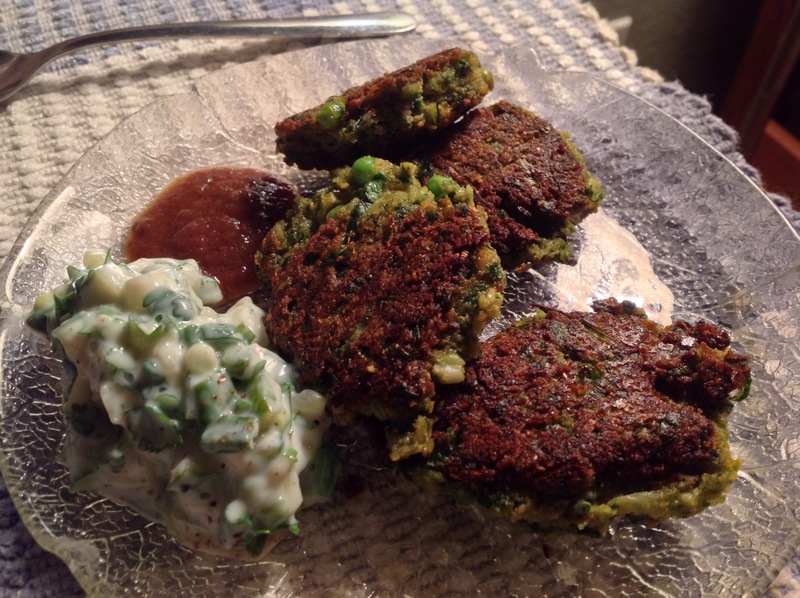 I am a huge fan of pakoras, but these tasted even better than the restaurant. If you only make one dipping sauce, let it be the raita I improvised. I haven’t had it in so long, because usually it’s dairy based, but my dairy-eating mum thought it was delicious, and actually we had to make more in-between pakora batches! 1/2 teaspoon garam masala, opt. 2. Grind orange lentils in a spice or coffee grinder until a fine flour (there will be some mealy bits). Measure out a cup. 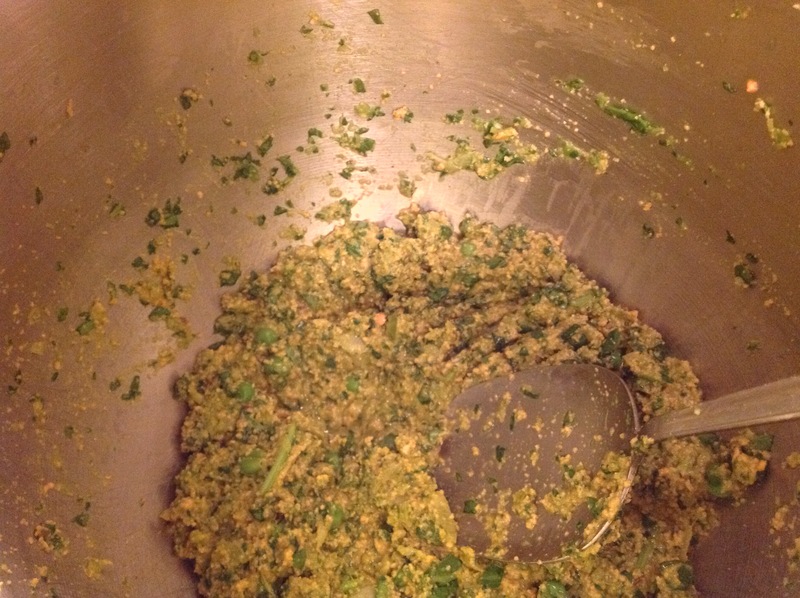 Add spices and egg replacer to lentil flour. 3. 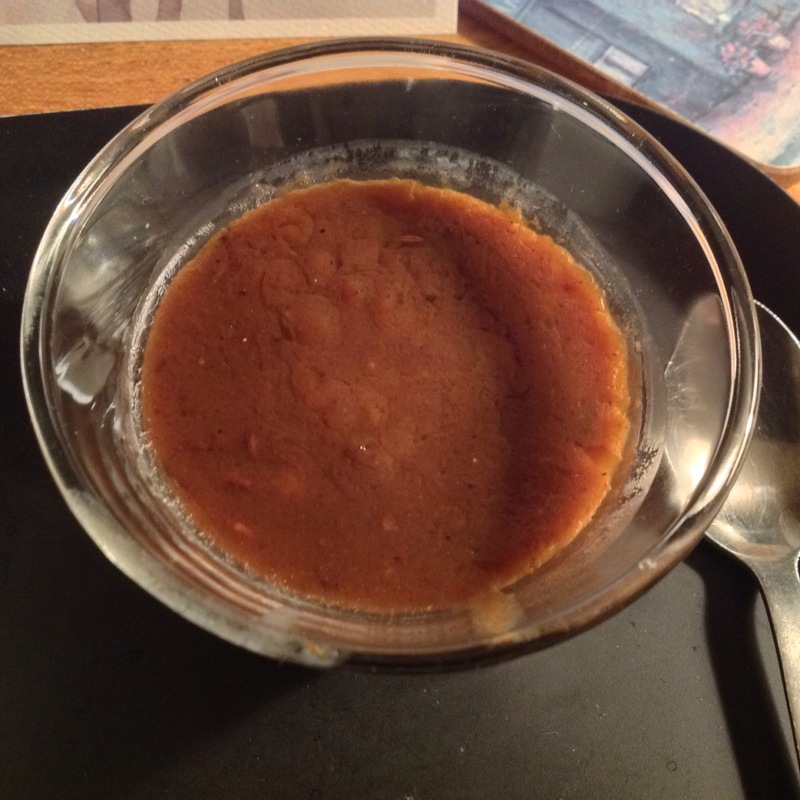 Add warm water and stir until forms a thick paste. It shouldn’t be too watery. 4. Refrigerate while you make the sauces (see below). This helps them firm up before frying or baking. 5. Add 2 tablespoons of oil to a frying pan and on medium heat. Wait until the pan is nice and hot, and then drop tablespoon-sized (we like them smaller and crispy!) dollops of the pakora mixture into the pan. Let fry until they are crisp on the bottom, then flip ( you made need to add more oil ). 6. Pat dry on paper towel before serving. 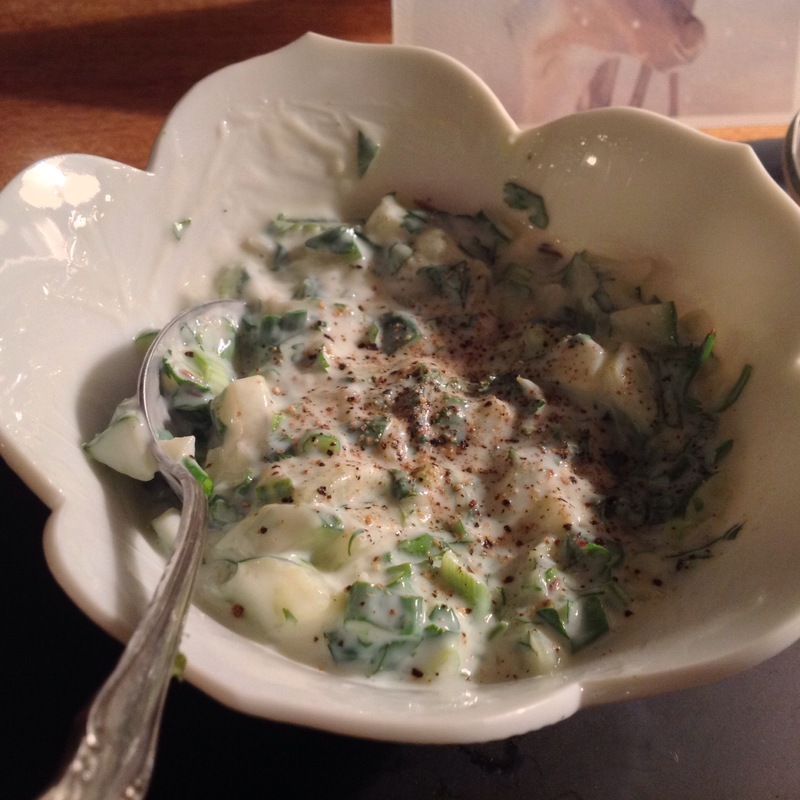 Quick Raita Dipping Sauce – you’ll probably want to double this recipe, right off the bat. it’s mad tasty!!!! It’d be great to dip veggies or crackers in too. 1. Mix all ingredients and voila. Magic. The sauce should be chunky and very green! Add more cucumber to taste – and believe me, you’ll want to taste it! 1. Blend in food processor or feisty blender until smooth and creamy. 1. Soak dried tamarind in water for 30 minutes. Break up mixture with fork. Better yet, soak overnight if you have time/patience. 3. Set aside the tamarind liquid. 4. Heat coconut oil in pan. 5. Lower heat, and add the cumin seeds and let them crackle, for 30 seconds. 6. Add other spices. Stir. Add tamarind. 7. Cook 2-3 minutes, then add sugar. 8. Cook for 5-10 minutes, until the sauce thickens. 9. Cool and refrigerate. Can keep for several months. Put all of these fabulous elements together and you have the plate of perfection. Happy Solstice, beautiful people.